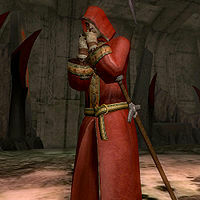 The Drothmeri Army is led by the rogue Telvanni Arch-Mage Frathen Drothan in his search for the Mehrunes Razor. They are currently tasked with guarding Sundercliff Watch while Drothan searches for the Razor deep inside. Their leader is Frathen Drothan, while Telani Adrethi is their second-in-command. 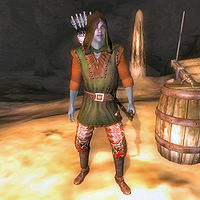 The Army is primarily made up of Dunmer mercenaries, criminals and rebels who wish to see the Empire overthrown. The recruits, soldiers, steward, and veterans all wear Drothmeri Tunics and are equipped with leveled heavy armor. They wield a leveled shortsword and bow, with leveled arrows. 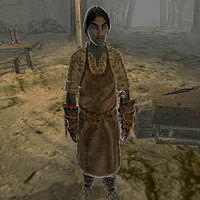 The Armor Apprentice is one of two apprentices of the Drothmeri Army's Forgemaster, the other being the weapons apprentice. He is evidently feeling somewhat unhappy with the limited number of chances to advance his skills, as shown by the letter he has sent to his sweetheart in Suran, unaware that in his absence she has had to start working at a less than savory establishment. 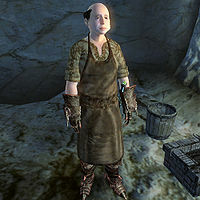 He wears a blacksmith's apron and a pair of blacksmith's pants. He also wears leveled heavy armor boots and gauntlets. In combat he wields a leveled one handed blunt weapon. He also carries a repair hammer, as every blacksmith uses to ply their trade. 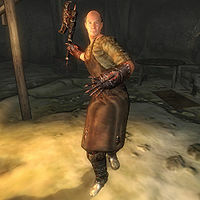 He seems to have a rivalry with the Forgemaster's other apprentice: one of them has sent their master a note accusing their counterpart of skulduggery. He is able to repair items, though he is always hostile to the player. 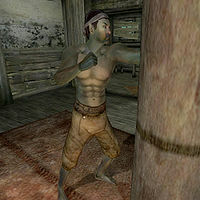 The Drothmeri Commander is a character added by the Mehrunes' Razor official plug-in. His full name is Telani Adrethi, as revealed by the Morag Tong Assassin's Writ of Assassination. Why the Morag Tong has orders to assassinate the Commander is not revealed, but this provides an easy way to kill the Commander, simply by releasing the Morag Tong Assassin. The assassin usually succeeds in killing the commander; even if he doesn't, the commander will be so injured that you will be able to dispose of him easily yourself. For more details, see the Drothmeri Commander article. The Drothmeri Recruits are the newest members of the Drothmeri Army. They wear a Drothmeri Tunic and a hood, and may wield leveled heavy boots, gauntlets, and greaves. They may also wield a bow and arrows or a short blade. The Drothmeri Soldier is a regular soldier in the Drothmeri Army. 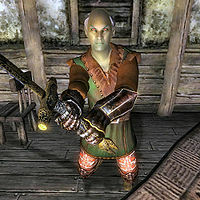 In addition to the Drothmeri Tunic, they may wield a leveled bow and leveled arrows or a leveled short blade, and may possibly wear leveled heavy greaves, gauntlets, and boots. For more details, see the Drothmeri Steward article. The Drothmmeri Veteran is a veteran soldier in the Drothmeri Army. In addition to the Drothmeri Tunic, they may wield a leveled longsword or a claymore, and possibly a leveled heavy shield and helmet. They will also use ranged destruction spells and conjured daggers. The Forgemaster is in charge of the production of material for the Drothmeri Army. He and his two apprentices have already churned out a large quantity of iron armor but still have a lot more to produce. Evidently stressed about his workload, he will attack you on sight. 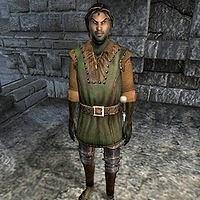 He wields a blunt weapon and wears heavy boots, gauntlets and greaves, all of which are leveled and possibly enchanted. He also carries several leveled potions and poisons. 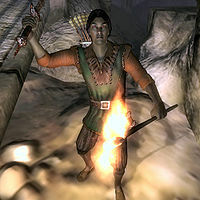 Of most interest, though, are the two unique items in his possession: the Forgemaster's Amulet and the Forgemaster's Smock. Even more importantly, he keeps one of the two enchanted bezoars necessary to advance into Varsa Baalim inside his tent. For the faction details, see this page. This page was last modified on 25 December 2013, at 19:41.